A checklist of 114 species in 15 genera of the Gnaphosidae recorded from Altai Mts is provided. A level of endemism and taxonomic composition of the Altai fauna are compared with those of other mountain regions of Northern Eurasia. A significance of the Altai Mts as a center for species diversity of several gnaphosid genera is evaluated. 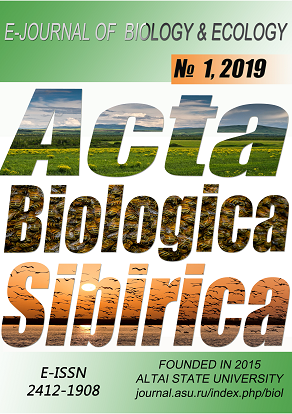 Comparative data on species diversity and distribution of ground spiders across different regions and altitudinal zones of the Altai Mts are provided. Regional gnaphosid faunas of the Altai are compared. A high level of endemism and its possible causes are discussed. Azarkina, G.N., & Trilikauskas, L.A. (2013). Spider fauna (Aranei) of the Russian Altai, part II: families Gnaphosidae, Hahniidae, Linyphiidae, Liocranidae and Lycosidae. EuroasianEntomological Journal, 12 (1), 51–67. Danilov, S.N. (1997). New data on the spider genus Micaria Westring, 1851 in Asia (Aranei Gnaphosidae). Arthropoda Selecta, 5 (3/4, for 1996), 113–116. Ermolajev, W. (1937). Beitrag zur Kenntnis der altaischen Spinnen. Festschrift Embrik Strand, 3, 596–606. Fomichev, A.A. (2016). New data on the spiders (Arachnida: Aranei) from Altai Territory, Russia. Arthropoda Selecta, 25 (1), 119–126. Fomichev, A.A., Marusik, Yu.M., & Sidorov, V.V. (2018). A survey of East Palaearctic Gnaphosidae (Aranei). 9. New data on the Parasyrisca potanini-group from Central Asia. Arthropoda Selecta, 27 (2), 155–168. Gvosdetsky, N.A. (1968) Physiographical regioning of the USSR. Moscow: MGU Publishers. (in Russian). Kuminova, A.V. (1960). Vegetation of the Altai Mountains. Novosibirsk: Izdatelstvo Sibirskogo otdeleniya Akademii Nauk SSSR. (in Russian). Levina, N.V., & Mikhailov, K.G. (2004). Spider (Aranei) fauna of mountainous Altai. Bulleten Moscovskogo Obschestva Ispytatelei Prirody, 109 (3), 38–52. (in Russian). Logunov, D.V., Gromov, A.V. & Timokhanov, V.A. 2012. Spiders of Kazakhstan. Manchester, UK: Siri Scientific Press. Marusik, Yu.M., Azarkina, G.N., & Koponen, S. (2004). A survey of east Palearctic Lycosidae (Aranei). II. Genus Acantholycosa F. Dahl, 1908 and related new genera. Arthropoda Selecta, 12 (2), 101–148. Marusik, Yu.M., Hippa, H., & Koponen, S. (1996). Spiders (Araneae) from the Altai area, Southern Siberia. Acta Zoologica Fennica, 201, 11–45. Marusik, Yu.M., & Kovblyuk, M.M. (2011). Spiders (Arachnida, Aranei) of Siberia and Russian Far East. Moscow: KMK. (in Russian). Marusik, Yu.M., & Logunov, D.V. (1995). Gnaphosid spiders from Tuva and adjacent territories, Russia. Beiträge zur Araneologie, 4 (1994), 177–210. Marusik, Yu.M., & Logunov, D.V. (2006). On the spiders collected in Mongolia by Dr. Z. Kaszab during expeditions in 1966-1968 (Arachnida, Aranei (excluding Lycosidae)). Arthropoda Selecta, 15 (1), 39–57. Marusik, Yu.M., Logunov, D.V., & Koponen, S. (2000). Spiders of Tuva, South Siberia. Institute for Biological Problems of the North Magadan. Mikhailov, K.G. (2013). The spiders (Arachnida: Aranei) of Russia and adjacent countries: a non-annotated checklist. Arthropoda Selecta, Supplement 3, 1–262. Ovtsharenko, V.I., Platnick, N.I., & Marusik, Yu.M. (1995). A review of the Holarctic ground spider genus Parasyrisca (Araneae, Gnaphosidae). American Museum Novitates, 3147, 1–55. Ovtsharenko, V.I., Platnick, N.I., & Song, D.X. (1992). A review of the North Asian ground spiders of the genus Gnaphosa (Araneae, Gnaphosidae). Bulletin of the American Museum of Natural History, 212, 1–88. Volynkin, A.V., Trilikauskas, L.A., Baghirov, R.T-O., Burmistrov, M.V., Byvaltsev, A.M., Vasilenko, S.V., Vishnevskaya, M.S., Danilov, Yu.N., Dudko, A.Yu., Dudko, R.Yu., Knyshov, A.A., Kosova, O.V., Kostrov, D.V., Krugova, T.M., Kuznetsova, R.O., Kuzmenkin, D.V., Legalov, A.A., Lvovsky, A.L., Namyatova, A.A., Nedoshivina, S.V., Perunov, Yu.E., Reschnikov, A.V., Sinev, S.Yu., Solovarov, V.V., Tyumaseva, Z.I., Udalov, I.A., Ustyzhanin, P.Ya., Filimonov, R.V., Tshernyshev, S.E., Tshesnokova, S.V., Sheikin, S.D., Shcherbakov, M.V., Yanygina, L.V. (2011). Invertebrates of the Tigirek Nature Reserve (an annotated check-list), Biota of the Tigirek Natural Reserve. Proceedings of the Tigirek State Natural Reserve, 4, 165–226. (in Russian).